Philip Glaze (Stourbridge CC) powered clear from a winning breakaway to clinch his first victory of the South Staffordshire and Shropshire Road Race League. The veteran rider was part of a three-man breakaway which escaped the bunch prior to the final climb and built up an unassailable margin to hold off the chasing bunch. Earlier in the race the handicap system saw the last group of riders catch a gap of seven minutes over the leading group over the 35 miles race including two ascents of the finishing climb. With the race together approaching the last few miles the winning breakaway formed on the undulating roads before the final climb. Over the top of the finishing hill the experience of Glaze showed as he powered clear to take a clear victory. He was chased home a couple of bike lengths behind by 16-year-old Farley Barber (Pro Vision Race Team) while previous multiple round winner Matthew Garthwaite (Rhino Velo Race Team) finished third. 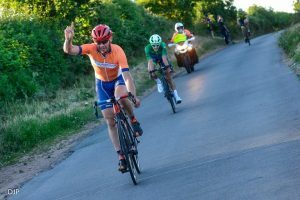 Behind overall leader Kirk Vickers (Rhino Velo Race Team) attacked in pursuit of the three leaders at the bottom of the finishing climb and was chased by leading overall junior George Mills-Keeling (Pro Vision Race Team) and team-mate Sam Beeston. Mills-Keeling had the fastest finish to take third while Vickers consolidated his leaders yellow jersey in fourth. First woman was Hannah Lancaster (Ludlow Brewery) in 31st place.